Vintage Racing Club of BC | BCHMR Report in Victory Lane! BCHMR Report in Victory Lane! 03 Aug BCHMR Report in Victory Lane! 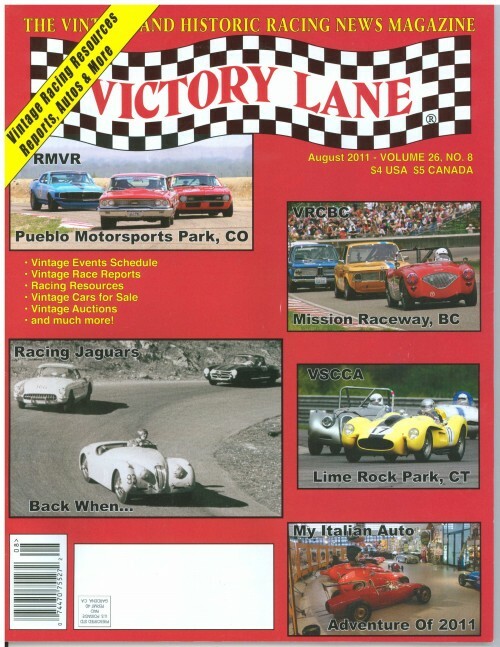 Victory Lane Magazine is a ‘Must Read’ for all Vintage Auto Racing fans. The monthly, which now also includes vintage rallies, concours and special events, covers the sport like no other periodical. Just click on the cover above to go to the Victory Lane website, which has the latest ‘hot news’ in the Vintage Racing world, as well as many interesting stories and links to useful information; and where you can easily order your own subscription online. The August issue has just been published. It includes a report on the 2011 BC Historic Motor Races with many great photographs by Marshall Autry and Jim Moody. If you don’t already have your own copy, you can read the story here.